Phytoplankton Reactor 360/5 (5 litre). 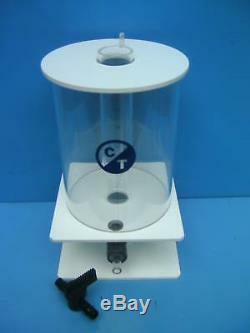 This plankton reactor is a purpose built device for the successful culture of phytoplankton. The reactor has a unique central positioning fluorescent tube that provides efficient use of all light. The phyto reactor also has a generous volume resulting in maximum yield every time. The phytoplankton reactor requires a standard 18 tube and starter unit, air-pump, airline, airline clamps and non return valve. Or the newer LED lighting kits.. Includes LED, Holder, Extension lead and 12v Adapter. Includes LED, Holder, Extension lead, 12v Adapter, Air Pump, Piping, Valves x 2 and Non return Valve. Also doubles as a superb high capacity vessel for growing brine shrimp to adulthood! Height (Top of Hose Tails) : 480mm. Base of Footprint : 165mm x 165mm. The item "Phytoplankton Reactor 360/5 (5 litres)" is in sale since Tuesday, December 15, 2009. This item is in the category "Pet Supplies\Fish & Aquarium\Filters". The seller is "bosshogthemasterpig" and is located in Sleaford. This item can be shipped worldwide.